Five Loyola University New Orleans public relations students won second–place in the 2010 Bateman Case Study Competition Friday, for a PR campaign they created to bring attention to the U.S. Census. The annual competition, organized by the Public Relations Student Society of America, asks teams from universities to tackle a comprehensive public relations campaign for a nonprofit organization, and this year the nonprofit was the U.S. Census Bureau. 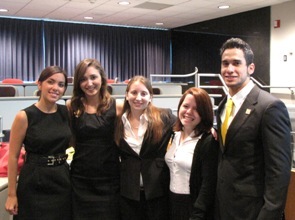 Jodi Forte, of Carriere Miss., Kate Gremillion, of Baton Rouge, Christine Minero, of Houston, Texas, Dominic Moncada, of El Paso and Marimar Velez, of Miami, Fla., comprise Loyola’s 2010 Bateman Team from the School of Mass Communication. Their campaign, “Down for the Count,” focused on contacting and informing traditionally undercounted populations about the importance of participating in the census. The team crafted a successful community and media awareness campaign which relied on partnerships that targeted New Orleans’ Vietnamese and Hispanic communities and college students. Team members spoke to students in English as a Second Language classes; addressed parents during family literacy night at a majority-Latino charter school; hosted a face painting booth and distributed census information at Mary Queen of Vietnam Church’s New Year Tet Festival; and reached out to area universities’ government associations, Greek organizations and service providers. In addition to the Loyola lineup, teams from the University of Georgia, which placed first, and Roger Williams University, which took third, were invited from a pool of 68 teams to present their campaigns in person before census representatives and Public Relations Society of America judges in Washington, D.C. The Loyola University Bateman Team has a history of high honors in this competition, having placed first nationally in 2009, 2008, 2005, 2003, 2000 and 1997 and second in 2006, 2004 and 2001. Public relations professor J. Cathy Rogers, Ph.D., supervises the public relations sequence at Loyola and advises the Bateman competitors. For more information on Loyola’s Bateman Team, contact Rogers at crogers@loyno.edu. For more information on the SMC in the College of Social Sciences, contact Catherine Koppel in the Office of Public Affairs at 504-861-5448 or ckoppel@loyno.edu.